Riley Pruitt, Gering, Neb., makes a calf roping run during the first go-round of the Nebraska State High School Rodeo Finals in Hastings, Neb., on June 24, 2010. Photo courtesy MT Photography. HASTINGS, Neb. – Riley Pruitt has some big shoes to fill, and he’s already started the task. He’s following in his dad’s footsteps. Troy Pruitt is the 1990 World Champion Tie-Down Roper. And his son is ready. The Gering, Neb., cowboy competed at the Nebraska State High School Rodeo Finals in Hastings, neb., and he’s walked away with three buckles so far, and hopefully more to come. Riley won his third consecutive tie-down roping championship at this year’s Nebraska High School Rodeo Finals in Hastings, Neb., and will make his third trip to the National High School Finals Rodeo in Wyoming next month. The 18 year old is no stranger to gold buckles. Last summer, prior to his senior year of high school, he competed in three amateur rodeo associations in Nebraska and Wyoming and won the tie-down roping year end championship at in all three. Riley, who graduated from Gering High School this past May, will attend Eastern Wyoming College in Torrington and compete on the rodeo team, while he considers a major. He’ll also hit the rodeo trail hard. His goal? To win a world championship, just like his dad. “I’m pretty young and I have a lot of goals,” he said. “I want to make it through college and I want to rodeo, and if I could make it to the NFR (National Finals Rodeo), that’d be great. It would be awesome,” he emphasized. The father and son pair will rodeo together over the upcoming Fourth of July. 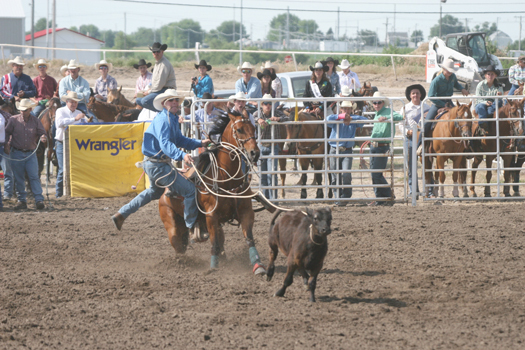 They’ll compete at rodeos in Mandan and Killdeer (N.D.) and Belle Fourche and Mobridge (S.D.) Troy says his son doesn’t rely on him for pointers. “He’s doing really good. He’s picking up a lot of the stuff on his own. He’s a real businessman.” Like father, like son. The state high school rodeo finals wrapped up on June 26th with the top ten competitors in each event. The top four event winners will earn a berth to the National High School Finals Rodeo in Gillette, Wyo., July 18-24. For more information on the high school finals, visit http://www.hsrodeo-nebraska.com.